In this Post, Checkout Complete Details about அண்ணா பல்கலைக்கழகம் மறு மதிப்பீடு முடிவுகள் 2018 - நவம்பர் / டிசம்பர் மறு மதிப்பீடு முடிவுகள் UG PG சமீபத்திய செய்திகள் Anna University Nov/Dec results were announced, Students who are not satisfied with their Results can apply for revaluation. Procedure to apply for revaluation results is given below. Students should apply for revaluation within the given date and time as told by the Anna university. we request students to check annauniversityupdates.com to get detailed information regarding the last date to apply for revaluation results nov dec 2018. After the release of Anna University Results 2018 UG PG Results, students who have got low marks and who were not satisfied with the results, Now can apply for Revaluation. 18 Jan 2019 - Web Portal is opened for applying Photocopy of the answer scripts of Nov/Dec 2018 Examinations. Last date for Candidates 25-01-2019. How to Check coe1annaunivedu 2018 odd Semester Revaluation results? Step 1: Now visit coe1.annauniv.edu students portal 2018. Step 2: In coe1 Homepage enter you REG-NUM, Date Of Birth, Solve Simple Captcha and Click on Login Button. Step 3: Now click on RESULTS TAB. Here in Results Tab, You can check your 2018 Semester revaluation.results along with the GPA for that semester. Step 4: If you need the paper copy of your result, then You can easily take print out of the results from the portal itself. [Q] What is the procedure for applying Anna university Revaluation? [A] www.annauniv.edu Revaluation consists of 2 phases, 1st one is for applying Photocopy of your answer sheet and Phase 2 is applying for correction. You can check the procedure details here. [Q] After how many days revaluation results would be published? [A] When you applied for Phase 2, the correction process usually takes 10 - 15 days and results would be announced after 20-25 days. [Q] What does "NC" mean? [A] NC = No-change (i.e) Same Grade as main semester results. [Q] After getting NC what can i do? [A] If you were not satisfied with Annauniversity Revaluation results, you have 2 ways. (2) You can apply for Review/Challenge. NOTE: Review/Challenge fees would cost "3000rs" per Subject. The evaluation procedure follows two stages, First students want to apply for the Photocopy by paying 300 Rs after getting the photocopy if there is any possibility to get extra marks due to errors in valuation, total mistake, etc.. Can apply for revaluation by paying 400rs finally. 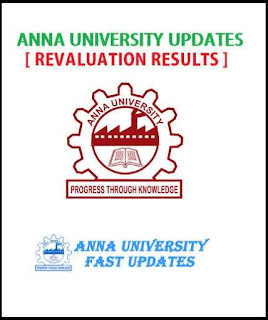 You can check the full complete Procedure for Applying Anna University Revaluation Here.